You've Got This Mama, Too on AMAZON! It's launch day for You've Got This Mama, Too, which means you can head over to Amazon to get your copy! If you already purchased a signed copy from me, thank you! I appreciate your love and support. (If you would prefer a signed copy over one from Amazon, I still have some of my personal books left. Just shoot me an email aimeelaurenswift@gmail.com and I can get one to ya)! 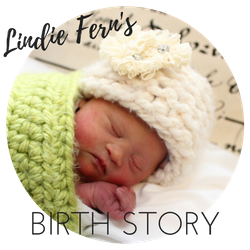 A few weekends ago we celebrated little Lindie Fern's second birthday with a small family party. I still cannot believe she is TWO. In some ways, we feel like she should be 10 because we feel like we've aged 10 years since she was born! (Seriously, gray hairs)! But in other ways we feel like it's flown by and (like all parents) wonder where the time went. I've said before that one of my favorite things about Lindie having Down syndrome is that I get my baby longer. Each developmental stage and milestone lingers and most of the time I love that. I mean, who wouldn't want time to slow down so they can enjoy their children longer? 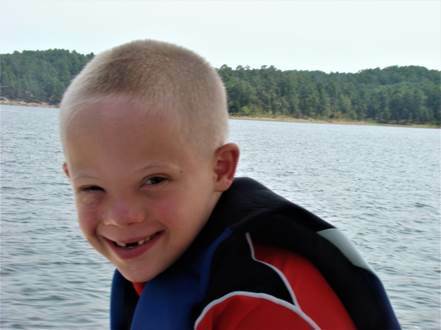 I really do think that's one of the sweet gems of having a child with Down syndrome! At two Lindie weighs about 17 pounds. She eats mostly pureed foods and has been not using the g-tube for about a month! (She does still have it, but we're hoping they take it out in May). She loves to crawl all over the living room and is beginning to discover crawling down the hallway to other rooms and into the kitchen. She loves music, her big sister, Beat Belle, Fisher Price Pup & Sis toys and chasing the Shark robot around while it vacuums. She does not love loud noises, being the center of attention, being taken away from Mama and getting in her carseat. She says "Dada, Mama (when she's really sad or wants something), Yaya (Eliza), All Done and Yes. She loves bath time, which is usually the only time she is willing to drink water. She keeps Mama busy with at least 4 therapy appointments a week + usually another appointment or two for something else. She is pure joy with a little bit of spice, which is why Big Sister has nicknamed her "Spicy Lindie." We love you Spicy Lindie! RAINBOW! She had so much fun helping me pick out ideas on Pinterest and putting them into action. Here's some of my favorite shots from her party. Since Lindie LOVES Beat Belle, we also incorporated her into the decor. Eliza & Chris even drew and colored a life-size Beat Belle for Lindie to keep! Eliza hand-painted rainbows on all the party favor bags and painted other rainbows to hang up around the house. I love all her personal flair with each rainbow! We also made sure all the food was rainbow themed as well. Which felt a little silly because Lindie doesn't even eat any of these foods, but oh well! My favorite part was making the Rainbow Cake out of cupcakes. I was really hopeful Lindie would actually eat one this year (she hates sweets) but she threw it on the ground. They were pretty anyway. Thank you to all our family who joined us to celebrate Lindie's second birthday! We had so much fun! Ashley is Mama to Willow, who has Down syndrome. Ashley, her husband Stephen and Willow live in a small town in Northern California. 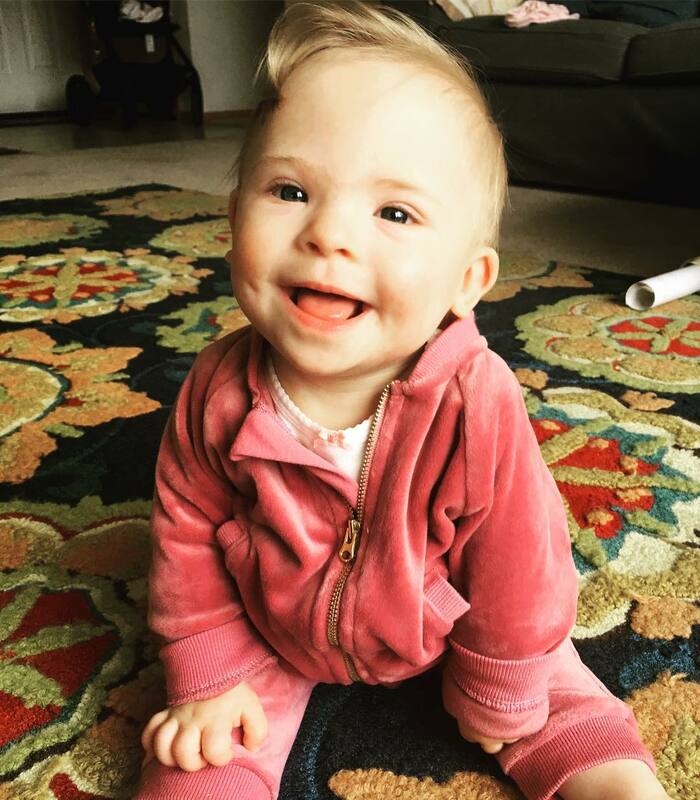 Willow is a beautiful 10 month old baby girl-- full of smiles and laughs! She is very empathetic, has a great sense of humor, and loves to experience new things. How does Willow bring you JOY? Willow brings me joy each day! 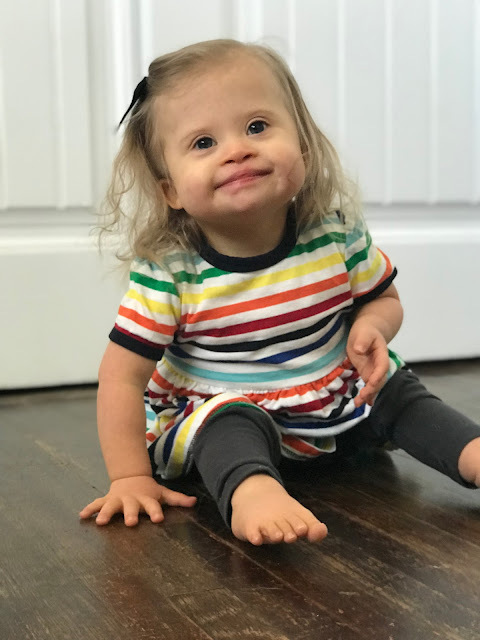 It has been so much fun watching her discover how her body moves- she's discovered her fingers and toes- started to bend her knees and use her legs much more, and is even working on sitting up unassisted! I've realized that we have found so much more joy along the journey to get to the milestone- than evaluating which milestone's she's meeting. She also has the most incredible laugh, which brings me unmatched joy each and every day! Thank you so much for sharing, Ashley! To follow Ashley & Willow visit her BLOG or INSTA. "I was 37 when I found out I was pregnant with my third child, William. Because I was older, I knew that I had an increased risk of having a child with Down Syndrome and prayed throughout my pregnancy for the health and safety of my baby. When it came time to do the normal pre-natal testing for spina bifida and Down Syndrome at 16 weeks, I declined because I knew that I would not choose to abort the pregnancy if the results came back positive. 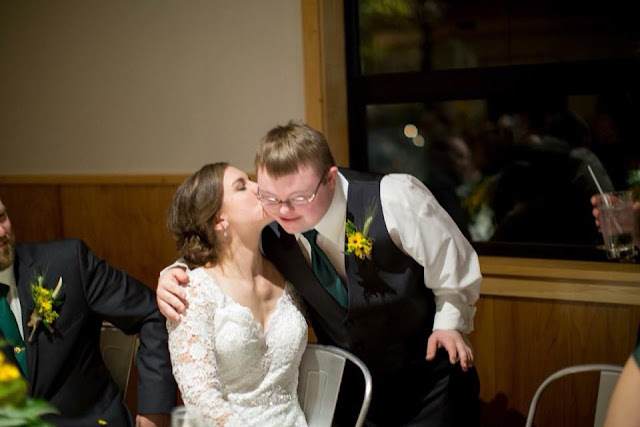 Thus, when Will was born at 37 weeks of pregnancy, I had no idea that he had Down Syndrome. It took our pediatrician about 4-5 weeks to make a firm diagnosis. 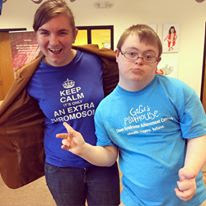 When we received the news that genetic testing had determined that Will did have Down Syndrome, we went through a period of grief and mourning the death of the dreams and expectations that we had for him. 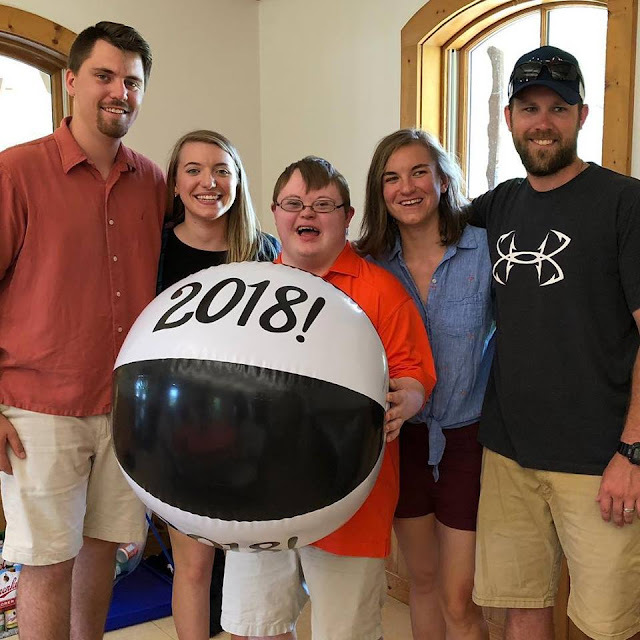 However, we had much to be thankful for in the midst of this difficult news – Will was very healthy and did not have the heart problems usually associated with Down Syndrome. We had lots of family and friends that loved, encouraged, supported, and prayed for us during that time of adjustment. They also continually reminded us that God had not made a mistake and that He would bless us through William. God had placed William in our family and we knew in our hearts that he was a gift just as precious as our normal children and that God would give us the strength and grace we needed to love, parent, and provide for him – whatever his unique needs were. Our lives were turned upside down at first while we adjusted to our new normal of a child with special needs. I unexpectedly had this new responsibility of accommodating Will’s out-of-town therapy needs for his developmental, physical, and speech delays while still parenting two other children, being a wife to a very busy husband, and taking care of a home. However, our family soon adapted to our new routine and Will quickly became a beloved and meaningful part of our family and did everything we did from going out to eat, to church, to athletic events, and to Bible Study. Our new life had many challenges to overcome but much joy as well. Our family developed new priorities and God taught us much through William, and still does. He helped us see that our worth, as God’s creation, is independent of any disabilities we might have and that we should not value people based on worldly standards. We are surrounded by a world that values physical beauty, athleticism, talent, and intellectual ability. If you do not possess these qualities, you are invisible and marginalized in our culture. William is none of these but he is happy, loving and funny in his own unique way and a tremendous joy and blessing to our family and community. 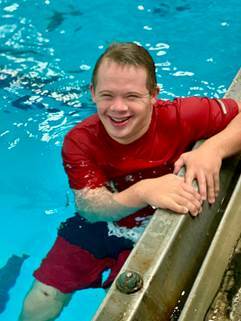 William is now 19 years old and has an engaging personality, a great sense of humor, is very active, and never meets a stranger. 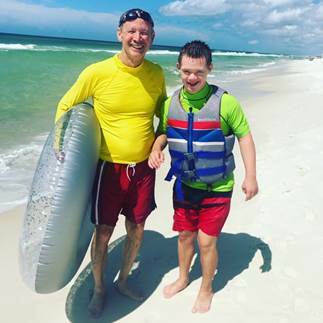 He is energized by doing things and connecting with people and enjoys an activity the most if he can do it with someone else. He loves the piano and all kinds of music and loves to dance. He also loves to swim, tube at the lake, ride bikes, play basketball, rake leaves, build chains with links, play cards and dominoes, and work puzzles. His grandmother adores him and loves for him to visit her on weekends where they enjoy going out to eat, going to church, and playing with links, cards and dominoes. I can’t go anywhere in town without people coming up to Will to give him a hug and share a kind word. 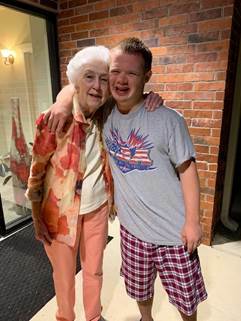 My elderly parents are in a local assisted living facility and Will’s daily visits are the highlight of their day! Will has his own unique personality just like the rest of us and it brings me so much joy every day to see how his fun and loving personality brightens the lives of those around him. 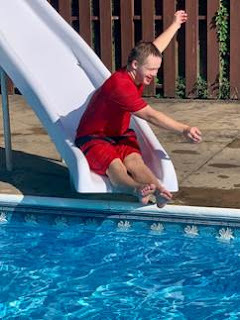 His smile, hugs, dancing, and excitement over making a very long chain, tubing behind the boat, and jumping off of the diving board, warm my heart with joy. You can make him happy by simply giving him a bottle of his favorite blue Gatorade to drink. He is unaffected by the cares and stresses of this world. There is much to be valued in, and learned from, his simple life with simple wants, needs and expectations. The most important thing any of us can do is to let God reveal His glory through our lives and gifts. God never promised us that our lives in this fallen world would be easy and struggle free. He did, however, promise to be with us. (Psalm 23) In the midst of our challenges and struggles, God calls us to respond in a Christ-like way that draws us and others closer to Him, matures our faith, and brings Him Glory and Honor. Although I often fall short of this high calling, God has taught me much through William about trust, patience, obedience, and finding joy, in the midst of worldly imperfection. God has used Will to reveal himself to us and give us new insight into what really matters in life. Will has made our family, as well as the world around him, more loving, compassionate, kind, caring, patient, and selfless. Will was fearfully and wonderfully made by God and all of his days were ordained by Him and written in His book before he was conceived. Psalm 139:13-16 I am eternally grateful to God for William and the joy it is to parent him and be loved by him. I cannot imagine my life or family without Will and cherish and celebrate every day God gives me with him!" Thank you so much for sharing Sarah. Your words and Will's story are so profound. So thankful for that! 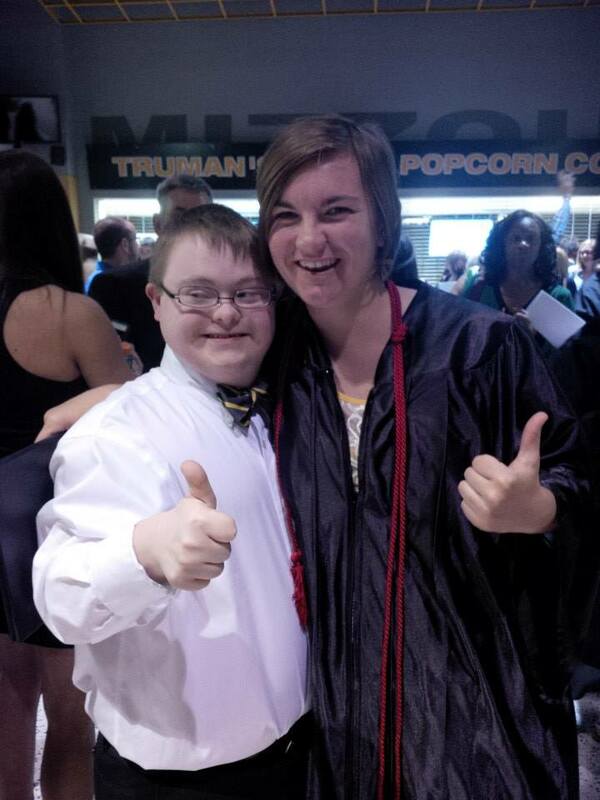 To follow Sarah & Will, visit her Instagram & Twitter. Hollyce is an work-at-home Mama to Hudson, Tyler & Emily. 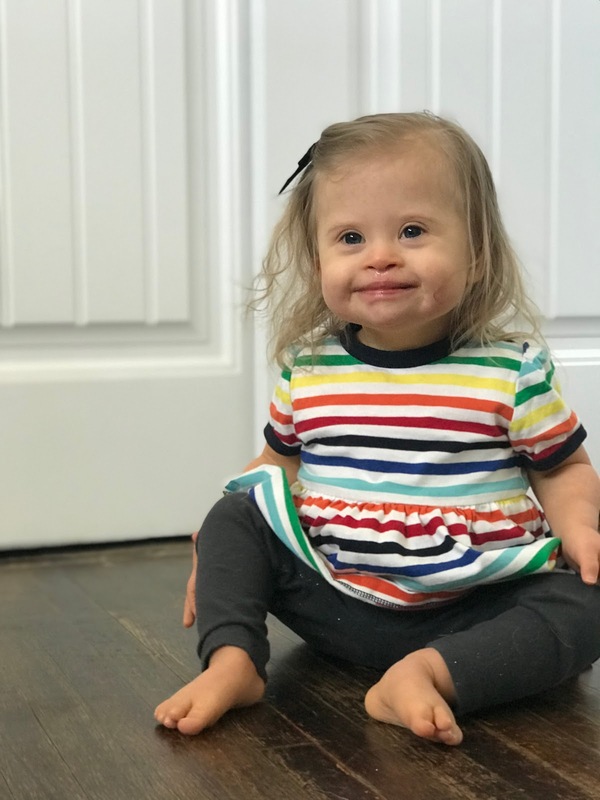 She loves sharing about her specially blended family and Down syndrome, among other things, over at her blog, Holding Moonbeams, and her Insta. She also teaches stroller based fitness classes for FIT4MOM. 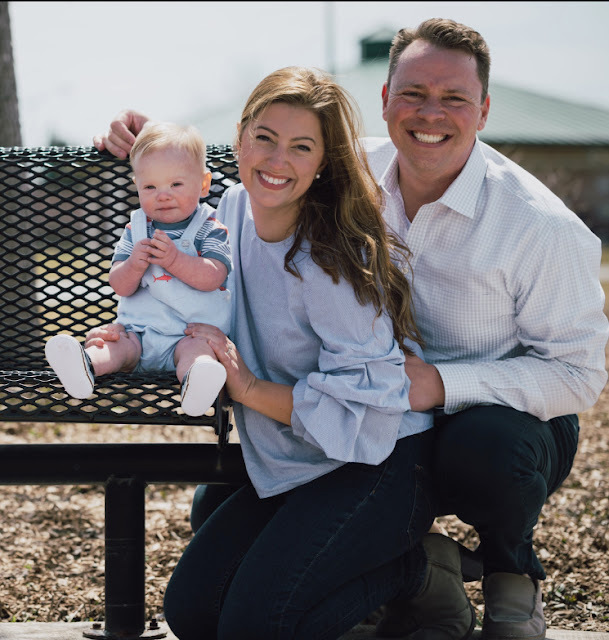 Hudson, who has Down syndrome is 17 months old. He is a big time flirt and little charmer, blowing kisses and waving to everyone. He's a hard worker - always pushing himself; but when he's done, all he wants is a good cuddle. His smile is warm and lights up his whole face. Hudson is curious about the world; he wants to touch, taste, and smell everything. His real sweet spot is a love for people. Hudson also loves music - dancing, swaying, bouncing, playing instruments. His favorite song is "I Like It" by Cardi B! Patience - everyone is traveling their own journey and figuring things out at their own patience. Extend some grace to others. Gratitude - each day has its own challenges and blessings. Be thankful for both! Mindfulness - be present. Enjoy the moment. You will miss these pieces of life as they pass you. Love on those around you and give freely and openly. How does Hudson bring you JOY? "Hudson sees the world differently - and in a much more beautiful way than those of us 'typical' folks who worry about things that are out of our control or are so stuck in the past that we can never move forward. Hudson brings light to every situation by embracing whatever he is doing and taking everything in. It's also through his love of people that I realize how Hudson will INFLUENCE this world. It's not through being President of the USA (not that it's the most coveted job these days) or CEO of a Fortune 500 organization. It won't be through the tasks and responsibilities he completes and it won't be through financial gains or losses. Hudson will impact the world through spreading his heart full of love and compassion - through people. Even thinking about that moves me to tears. Hudson will love so fiercely and deeply that he will bring happiness to people we haven't even met yet! What an unbelievable gift that is for a human being to give to another." To follow Hollyce & Hudson, visit her BLOG or INSTA. Sarah is Mama to Hazel, who has Down syndrome. She is an Early Childhood Special Educator turned Early Childhood Special Educator at home Mama! 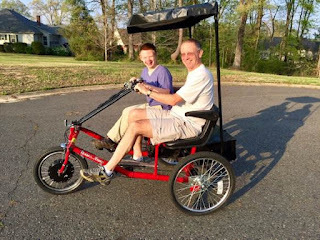 She loves sharing her life with her hubby and Hazel on Instagram and especially loves to share how she does this at home with a fun "therapy meets play" focus. "Hazel just turned two and a half. She is determined, feisty, hilarious, and the best thing that ever happened to her Dad and I." 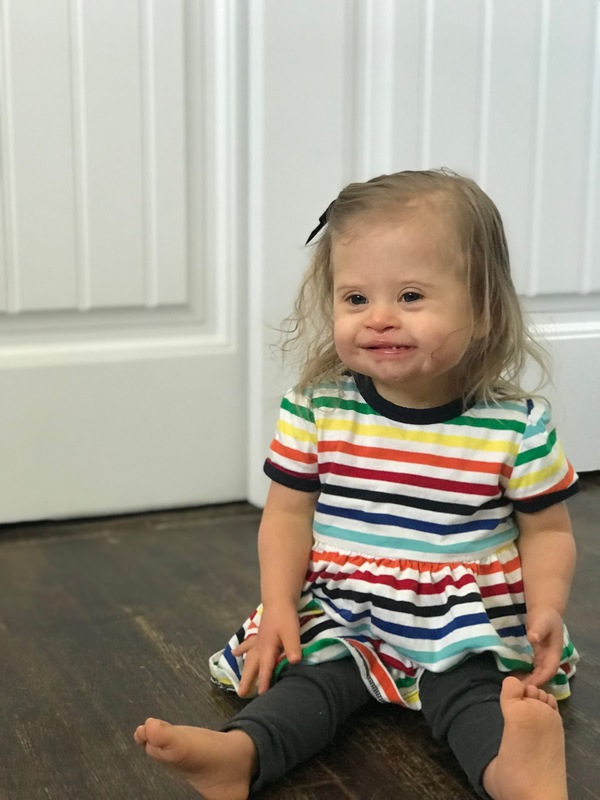 "We knew Hazel would be born with Down syndrome before she was born. The second half of my pregnancy was filled with doctor's appointments, anxiety, and lots and lots of tears. 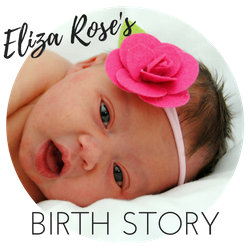 Hazel took her sweet time arriving earth side but as soon as she was placed in my arms, I felt the most profound sense of peace. Here was my baby, absolutely perfect and exactly who she is supposed to be. Hazel runs into every room waving, blowing kisses, and asking for high fives. She brings smiles to every long line and quiet elevator just by being her. She inspires me to be more myself and to see the worth in everyone I encounter." How does Hazel bring you JOY? "I stay home with Hazel after years of working with young children of all abilities. I was so worried being home with her would be boring. Instead, I find SO much joy in helping her meet milestones and in creating learning activities for her. She loves to paint and draw and play with her baby dolls. Every day she wakes up ready to learn and is so very persistent in all she does." 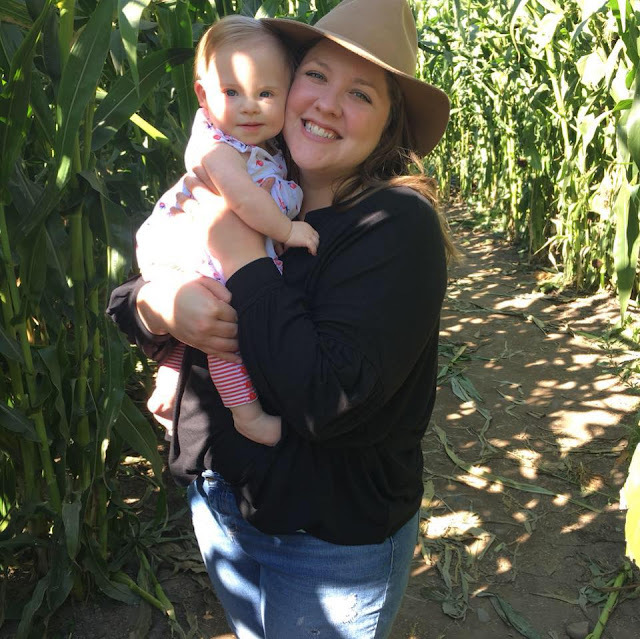 Sarah, you are rockin' this motherhood thing and are such an inspiration! Thanks for sharing, friend! To follow Sarah & Hazel, visit them on Instagram HERE. Amanda is Mama to Owen and Rory and wife to Evan. 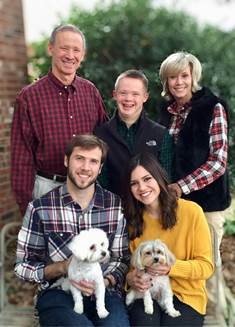 She is also the owner and creator of The Glory Days Planner, a planner created specifically with special needs families in mind, that will launch in mid-November. Rory is a year and 5 months old. She is so sweet, funny, smart and loving. She loves to be independent and explore her soundings. Rory is always on the go, keeping Amanda on her toes at all times. "Rory has shown me you can't assume the worst. When Rory was born we were told and came across a lot of scary things about Down syndrome. None of them have been true. She is progressing, happy and engaged. I feel so lucky to have her and all the families she has connected us with. Rory's life has so much value and potential." How has Rory brought you JOY? So much JOY. Every time you look at her she smiles. She radiates love and happiness in such a special way. She has made our whole family more connected and joyful. 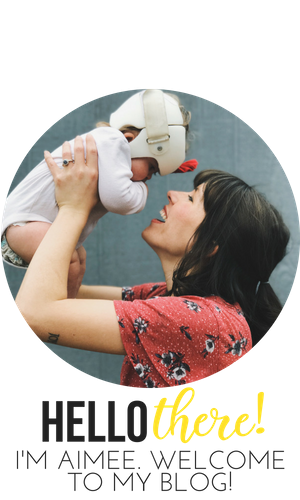 Be sure to check out Amanda's amazing planner, inspired by Rory and the unique needs that comes with raising a child with special needs. You can also find her on Instagram, Facebook, Pinterest & Twitter!